(Nanowerk News) A $1 million grant from the National Cancer Institute’s Small Business Innovation Research program will enable UCLA scientists and industry partners to take an innovative lung cancer treatment through the final steps toward its first clinical trial. The treatment combines an immunotherapy agent called CCL21 with a drug delivery nanotechnology using biological particles called vaults. It was developed by Dr. Leonard Rome, associate director of UCLA’s California NanoSystems Institute, and Dr. Steven Dubinett, director of the UCLA Clinical Translational Science Institute, both of whom are also members of UCLA’s Jonsson Comprehensive Cancer Center. 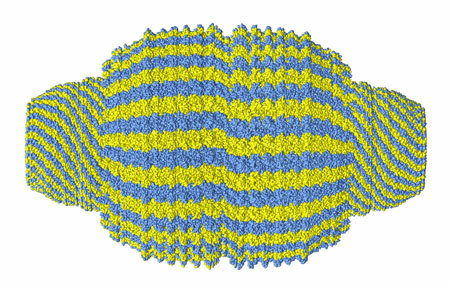 Model representation of a nanoscale 'vault' from rats used to study the new treatment. To move CCL21–vaults into human trials, UCLA is collaborating with Vault Nano, a startup company dedicated to providing safe and effective immunotherapy to people with cancer and infectious diseases. UCLA is also working with Protein Sciences Corporation, the industry sponsor of the SBIR grant, to produce the vault nanoparticles. Protein Sciences has a patented, FDA-approved cell line to optimize production of the vault nanoparticles in a good manufacturing practice, or GMP, facility, which will allow the vaults being tested to eventually be used in humans. The grant will enable Protein Sciences and UCLA to complete the treatment’s preclinical safety evaluation, which will assess its toxicology, efficacy, formulation and preclinical product manufacture. The Small Business Innovation Research program is part of the NCI’s efforts to develop and commercialize novel technologies and products to prevent, diagnose and treat cancer. It is one of the largest sources of early-stage technology financing in the United States. The experimental treatment is novel because it uses biological nanoparticles called vaults to deliver a cancer immunotherapy agent directly to the tumor cells. Nanoparticles are so tiny that they are measured in nanometers. Vaults, which were discovered in Rome’s laboratory in the 1980s, are particles made from proteins that exist within all human cells. Rome’s team also discovered a way to construct vaults from their original protein building blocks, but with hollow centers that could contain and gradually release drug molecules. Unlike traditional chemotherapy — which kills cancer cells directly and tends to cause negative side effects because healthy cells are also destroyed — cancer immunotherapy awakens the human immune system to attack the cancer, leaving healthy tissue untouched and greatly reducing side effects. CCL21 is a type of protein called a chemokine that normally resides in the human lymph nodes, where it acts as a beacon to T cells and dendritic cells, the elements of the immune system that find and destroy bacteria, viruses, and other causes of disease. Under normal circumstances, these attack cells do not recognize tumors as an enemy. When the CCL21–vaults reach the cancer cells, the chemokines alert the immune cells to enter the cancer and eliminate the foreign cells. Thus, tumors are reduced without affecting the surrounding healthy tissue.